- Đây là dòng NAS thế hệ 2016. Buffalo thay đổi chipset từ ARM sang chipset Intel. Đây là dòng chipset tốc độ cao hơn, độ ổn định tốt hơn. Đặc biệt ở phiên bản 2016 này, độ ổn định nguồn và bảo vệ ổ cứng tốt hơn các dòng trước. – Tốc độ đọc 100+MB/s khi nối LAN gigabit. Đánh giá: Đây là model 2016 sử dụng chipset Intel có hiệu năng cao hơn chipset AMR. Độ ổn định cao hơn và chịu tải cao hơn. Easily access files the same way you do with smartphones, tablets, and computers. Gives everyone in the family quick access! This unit enables high-speed data transfers with speed more than 100 MB/s. Enjoy getting to your photos, movies, and music quickly and reliably, even with the entire family accessing their data at the same time for this unit can support up to 16 devices accessing at one time. You can access the LinkStation even while away and use it like a smartphone or notebook computer's extenal HDD to enjoy video, music,photos, and other data stored on the NAS. The Web Access application lets you access and manage your home NAS simply and easily from smartphones, tablets, and computers, anytime and anywhere. Being able to use your home NAS anywhere is like walking around with a high-capacity hard drive. But this way, there is no need to save and carry around data on your smartphone, tablet, computer, or other mobile device. 1. NAS can be used simply and easily with a variety of different devices, from smartphones to tablets and computers. 2. Sharing files with friends and acquaintances is simple. 3. There's no need to bother with copying files to the device. This means there is no need to be concened about the device's storage capacity. 4. If the mobile device is ever lost or stolen, the data is still safe on the NAS. LS520 Diskless Enclosure features two intenal drive bays with RAID 0/1 support when two hard drives are installed. Easily install up to two hard drives and automatically duplicate your data when configured in RAID 1 (hard drives not included). 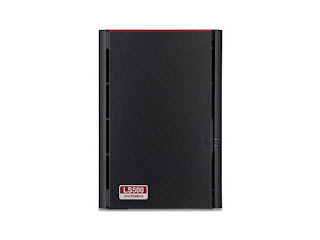 With LS520DE, a second hard drive can be added at any time and the unit can be configured in RAID 1 with no data loss. Easily mirror and protect your data with no time lost. Capacity can be expanded easily without risk of losing data. Switch one drive to a drive that has more capacity. Then, switch the other drive. Hard drives are easily accessible via the front panel. You can use iTunes on any computer connected to the LAN to automatically find and stream music files saved on the LinkStation. The feature supports playback of files on up to five computers and transfers to iPods. * When transferring files to an iPod from the LinkStation, adding the LinkStation's shared folder to the iTunes Library allows you to transfer the files through iTunes. Please note that files cannot be transferred using Explorer and other programs. Easily find and connect to your LinkStation using the NAS Navigator tool. NAS Navigator finds all NAS devices attached to your network, making it easier to manage multiple NAS devices. You can also access the LinkStation from smartphones, tablets, computers, TVs, and game devices on the network, allowing you to enjoy video, photo, and music files saved on the LinkStation through these devices. DLNA-compatible TVs and game devices can directly play data stored on the LinkStation. A single LinkStation can be used as the central device for storing all kinds of data on the home network. Plug a USB hard drive into the available USB port to expand the total capacity of your LinkStation unit. Extenal storage cannot be added to the LinkStation RAID array. Back up Windows PCs with NovaBACKUP Workstation. 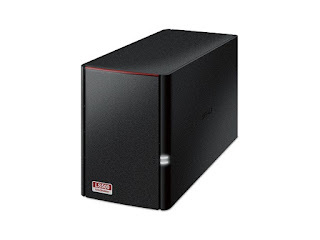 Included with each LinkStation NAS unit is five free licenses of NovaBACKUP Workstation, an easy-to-use backup solution that automatically backs up your personal documents along with your favorite photos, music and important email files safely and securely. Back up PCs, notebooks and workstations. LinkStation supports Time Machine for Mac users. Schedule backups from one or multiple Mac computers on your network. LinkStation via your home or office network (on LAN), or via the Intenet (with IP). *Only Back up from LS500 to LS500 is supported. Backing up to other models is to be supported after firmware updates. Simply plug a USB hard drive into the USB accessory port on your LinkStation NAS unit and easily back up the contents of your LinkStation. Only AC powered hard drives are supported. The LinkStation features a Timer ON/OFF function that allows the power to be switched on only at predetermined times. This both enhances convenience in using the NAS and conserves energy, and prevents wasted electricity from forgetting to switch the power off. This reduces wasteful power consumption that results from leaving the power on after office hours, on days off, or anytime the drive isn't needed, thus reducing CO2 emissions and helping the Earth's environment.